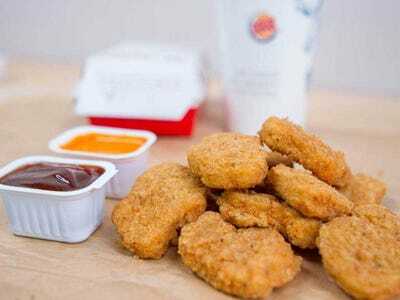 Burger KingBurger King is selling 10 nuggets for $US1. Burger King is selling 10 chicken nuggets for just $US1 as a part of a new deal. The bargain comes at a time when fast-food chains are scrambling to slash prices to appeal to budget shoppers. McDonald’s,Taco Bell, and Wendy’s have all debuted new deals over the past year, and KFC tells Business Insider it is tweaking its strategy to win over “pinched” customers. Burger King is slashing the price of nuggets as fast-food chains battle for budget shoppers. On Thursday, Burger King will debut a limited-time deal that offers a 10-piece Chicken Nugget meal for just $US1. The deal undercuts even McDonald’s impressive on-again, off-again chicken nuggets deal of 20 nuggets for $US5. The deal comes at a time when fast-food chains are scrambling to slash prices to appeal to customers who can’t afford to spend more than a couple of dollars when eating out. KFC recently told Business Insider that the chain is testing new deals in response to a competitive industry and economically squeezed customers. In 2018, Wendy’s expanded its 4-for-$US4 bundle deal, Taco Bell doubled down on its $US1 menu, and McDonald’s debuted its new $US1 $US2 $US3 menu. While the median US income is on the rise, top earners’ income growth is significantly outpacing earnings increases for lower-income households. In 2017, the top 5% of households saw average incomes rise to 8.7% higher than prerecession levels. Among the bottom fifth of the population, average incomes still grew but remained 2.7% below prerecession figures. Additionally, high gas prices are weighing heavily on lower-income shoppers, cutting into their disposable income. A UBS Evidence Lab survey shared with investors in March found that customers said “good value” was the top reason they would visit a fast-food chain more often. According to the survey, the emphasis on value is one of necessity. Having “less free spending money lately” and chains being “too expensive” were the top two factors that customers cited for eating at a particular chain less often.